Part 1: Transparent Selections and "Under painting." Click on the image on the left to open the larger size in your browser. First of all, the light is too big to fit in the picture properly, so let's resize. Go to Image > Resize from the Menu Bar. Use the Percentage of original area and type in 75 percent. Set the background color in PSP to black. At the top of the color palette, click on the right hand swatch, and pick black, RGB = 0,0,0 from Color Picker Dialog box. On the Chandlier1 image, right click the Title bar and select Copy from the fly out. 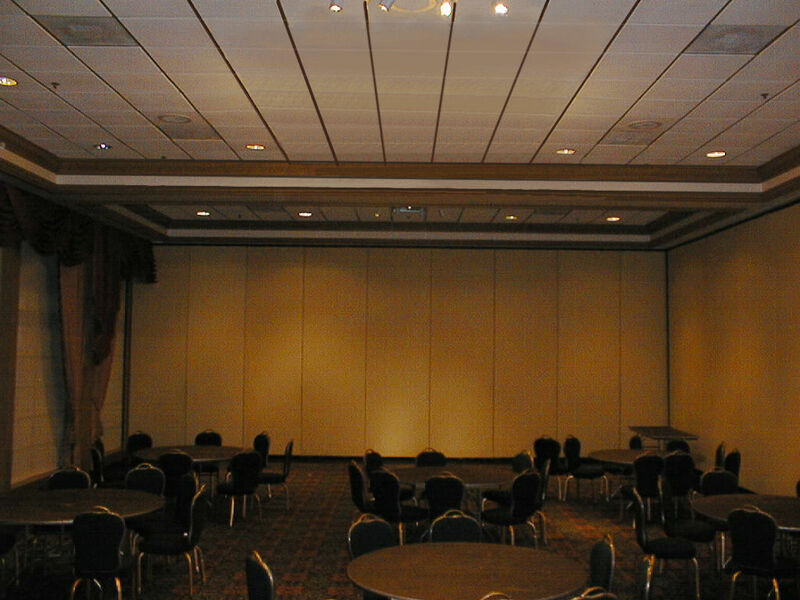 Select the Ball room image by clicking on its title bar. Whatever color the background color is set to in PSP will determine what color in the transparent selection will be transparent, that is dropped out. Be careful with this, because there is no RANGE to set, the color is either going to be totally transparent or totally opaque. This feature is handy ONLY for eliminating a solid background or other area of solid color within a pasted selection. 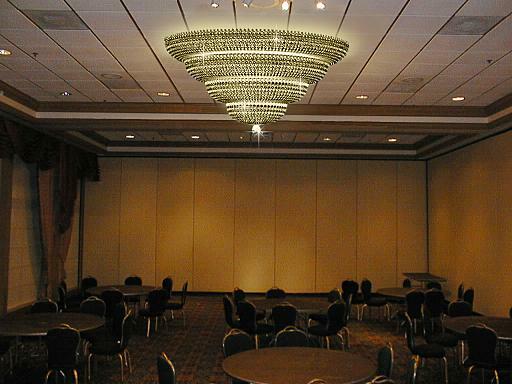 Notice how only the NON black parts of the chandelier image shows up in the ballroom. While the light is still attached to the cursor, move the light to a good position on the ceiling. Click to set the selection. It is still a floating selection at this point which can be moved around with the 4 headed arrow tool. Nice light, but the color of the chandelier doesn't match the image at all and looks way too fake. Let's practice "underpainting" the light to change its color. 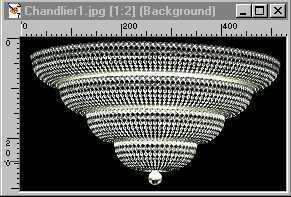 In PSP, close the Chandlier1 image as we don't need it anymore. 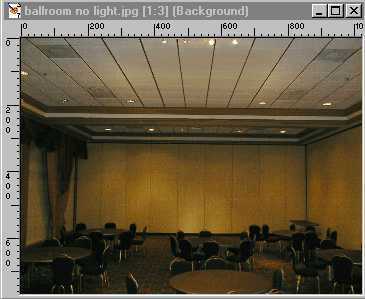 On the ballroom image, go to Selections on the Menu Bar and pick Promote to Layer from the fly out box. On the layer palette, rename the Promoted Selection layer by right clicking on it, picking rename on the fly out box, and typing in Chandelier. 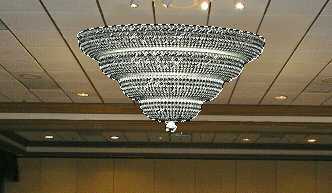 In order to underpaint a color, make a new raster layer above the background layer under the Chandelier name. Right click the background layer on the Layer palette, pick New Raster layer from the fly out box. On the Layer properties box that pops up, name the layer Underpaint Light and press OK.
On the layer palette, change the blend mode for the Chandelier layer by clicking the right facing arrow on the right side of the Layer palette and choosing Luminance from the flyout box. Select the Underpaint layer by clicking on its name if it is not already highlighted. 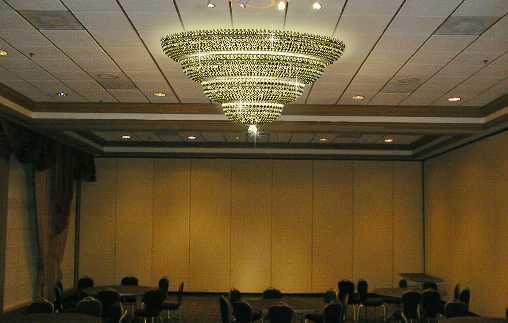 In the image, notice that the color from the room shows through on the chandelier. Nice... BUT a bit too coppery. It should be a tad yellowish. From PSP's Tool box, pick the Paint Brush. Set the Foreground color style to Solid color by clicking the right facing arrow next to the swatch and choosing the paint brush icon on the fly out. Click directly on the swatch and set the color to R= 245, G= 229 and B = 175, a light orangey yellow. On the Tool Option Palette, set the brush to shape of round, Size of about 60, Hardness to 0 Opacity to 100. Paint over the light (on the Underpaint Layer) and watch the colors change to more yellow. It is OK to do a sloppy job, we can fix that. Pretty neat eh? Let's clean up the edges. Select the Chandelier layer on the layer palette. Pick the Magic Wand selection tool on PSP's Tool Palette. On the Tool Options Palette set Opacity as the type, no feather, tolerance to 0. 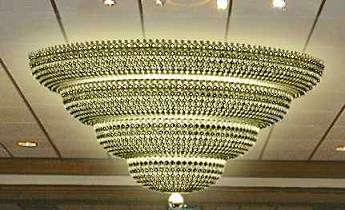 Click on any transparent pixel outside the chandelier. Invert the selection by going to Selections > Invert on the Menu Bar. 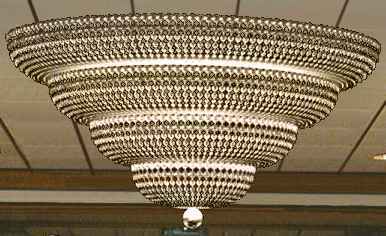 Just the outside of the Chandelier is selected. From the Menu Bar do a Selections > Modify > Contract > 2 pixels and a Selections > Modify > Feather > 2 pixels from the Menu Bar. 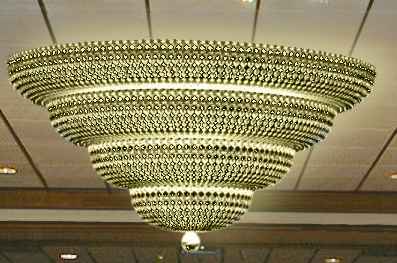 Note how the edges of the Chandelier are softer. With the selections still on, change layers to the Underpaint Layer by clicking its name on the layer palette. Repeat the Clear by pressing the Delete key or doing Edit> Clear from the Menu Bar. Now the Yellow layer is cleaned up just nicely as the Chandelier layer. Turn off the background layer by clicking the eyeglasses icon next to its name. Right click one of the remaining two layers on the layer palette choosing Merge > Merge Visible from the fly out box. 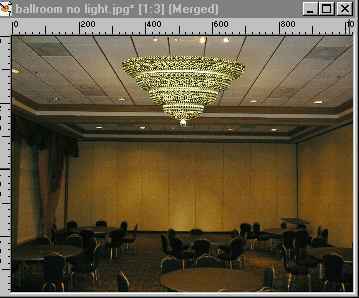 Move the Chandelier layer around in the image with the 4 headed mover tool until satisfied with its final position. Since it still looks stuck on the ceiling and not really integrated, let's make it more realistic. With the Merged layer selected, engage the Magic wand tool, set to match mode = Opacity, Tolerance 168. No feather. 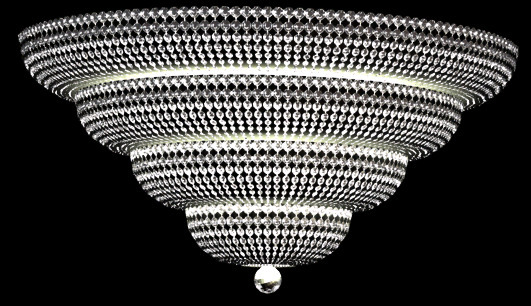 Click outside the chandelier to make a selection then invert it. Selections> Invert from the Menu Bar. Go to Effects > 3D Effects > Drop Shadow. 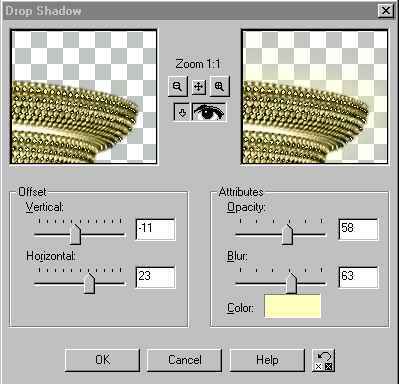 On the Drop Shadow dialog box, set the following. Vertical Offset = -11, Horizontal Offset = 23, Opacity 58, Blur 63. Color set to yellow. Repeat the drop shadow but change the Horizontal Offset to -23. Almost done. Invert the selection again. Selection > Invert from the Menu Bar. Take the Eraser tool setting the the Tool Options to Round for the Shape, Size around 68, Hardness 0, Opacity around 50. 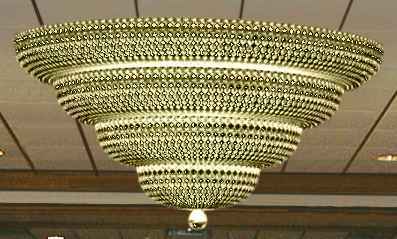 Erase the yellow glow around the bottom of the light and on both sides up to the middle of the top tier. 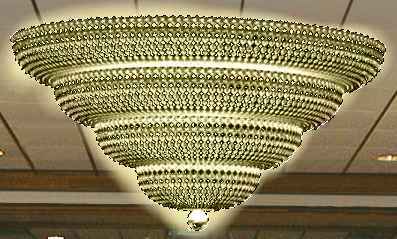 Basically, we want the glow concentrated on the ceiling as if the light was suspended a little bit. 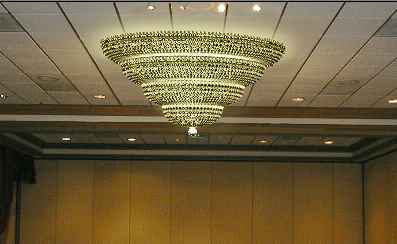 Last thing I will do is apply a Plain White Sparkle tube on several places on the chandelier to draw attention to the light. This tube is available from Hood's Tubes Page. And we are done! Click on image below for a bigger clearer version. 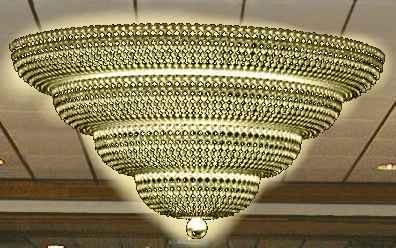 Actually this was a real life project, but instead of compositing the pictures in Paint Shop Pro, I created a 3D Model of the chandelier in trueSpace and rendered the light onto the ceiling. However now that I look at it, I like the composited version even better than the render!